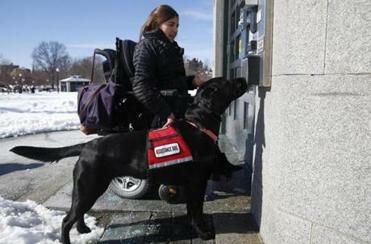 Carolyn Barrett&apos;s service dog, Shadow, pressed the button to open an automated door. Ducks on planes? Bunnies in restaurants? Alpacas in the drugstore? We increasingly face a menagerie in public places, part of a trend that suggests person and pet are inseparable. Animal lovers grow bolder by the day, often claiming the animals provide essential emotional comfort. What’s the harm of sharing an airplane cabin with a pig, right? Problem is, tolerance for support animals, originally a privilege extended by some businesses, is evolving into an assumed right, at times undermining the needs of people who legitimately must have a service animal to navigate life. In many cases, passing a pet off as a support animal is an act of small-time fraud. Pet lovers take advantage of websites selling bogus equipment — vests, ID tags, and “certifications” — to designate a pet as an emotional support or service animal. And because there’s widespread misinformation about what kind of legal protections exist around service animals, the scam is easy to get away with. Unfortunately, current federal law is vague and conflicting. The Americans with Disabilities Act only recognizes dogs and certain miniature horses as service animals. 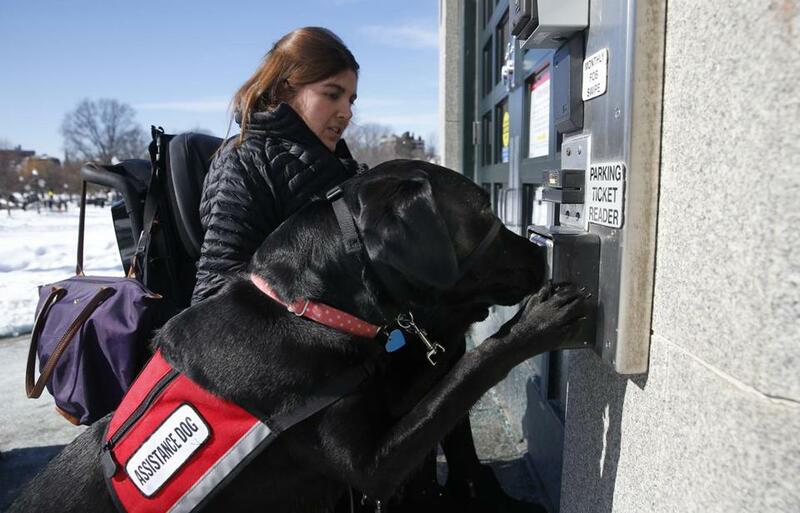 They are required to be individually trained to perform a specific task for a person with a disability: dogs that fetch items on command, turn light switches on and off, lead blind or deaf people, etc. It can cost up to $40,000, and take several years, to acquire and train a dog to perform some specialized tasks. Restaurants, airlines, and other businesses must accommodate such animals. To fight the growing problem of fake service dogs, a proposed bill would make it illegal to misrepresent a pet as a service animal in Mass. The ADA, however, does not cover emotional support animals, or those whose “mere presence provides comfort.” In other words, CVS can’t be required to recognize your emotional support parrot. But the rules are muddier on airlines, which are also subject to a different set of rules. The Air Carrier Access Act allows passengers to bring their self-designated and unofficial emotional support pets in airplane cabins. That’s why state Representative Kimberly Ferguson filed a bill on Beacon Hill to crack down on abuses. The bill, which will be heard on Tuesday, makes it a civil infraction, carrying a $500 fine, to intentionally misrepresent a pet dog as a service animal. It’s a step in the right direction — one already taken by a dozen states — that Massachusetts lawmakers should swiftly codify into law. Still, the crackdown doesn’t go far enough; more substantive reform is needed at the federal level. After a particularly horrifying incident on Delta Airlines recently, where a man was mauled by a fellow passenger’s emotional support dog during boarding in Atlanta, federal authorities are being pressured to regulate access more strictly. New standards for airlines that can be easily enforced are long overdue. Fake service dogs and dubious emotional support animals on planes can endanger public safety. Worse yet, by distracting legitimate service dogs, they may even harm the very people the legal protections for service animals are meant to help.